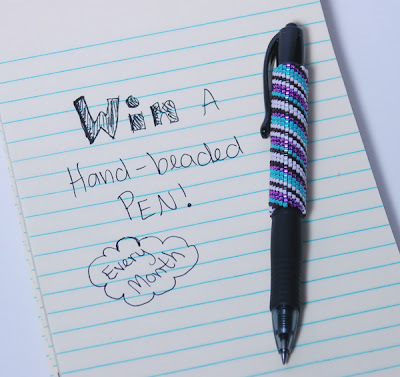 Mandibeads: November Giveaway: Win A Pen! I just RT your giveaway on twitter. My fave is the Green Jagged Motion Pen -- it's gorgeous! I wonder if some seasonal pens would be fun? Maybe a candy cane for the holidays or a dove or something? I like the Red Velvet Cupcake pen... ok, my daughter wants it! ;-) I like La Alicia's ideas. 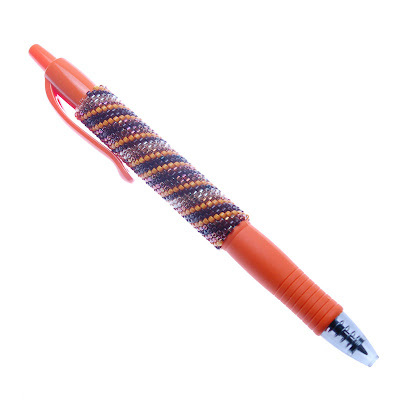 I think it would be cool to find a good way to personalize pens (do the names in the beads)... I can imagine a white pen with silver beads with the name of a bride and groom to be used for a guest book... or a black pen with a name and graduation year in the beads. I'd also suggest adding the red and purple color combo... its a gorgeous combo, AND there's always the red hat'rs that would love it! I have to say I am drawn to the red velvet cake one. I love cupcakes. I already have the purple cupcake pen (and I love it!) so I'd have to pick the sophisticated circus pen, too cute. Oops..and I retweeted your post, too!